Dr. Sandy is joining us to talk about body contouring. This is the word we use to describe the non-invasive devices and procedures that dissolve fat, treat cellulite and tighten the skin. Thank you Nina for allowing me to share my thoughts with your blog readers again. Most of you know that I love to exercise, especially run. Yet despite trying to do all of the right things, I still have annoying pockets of fat that will not go away. For years, I have been researching all of the available technologies for a non-surgical way to permanently get rid of fat. Earlier this year, Honey, Nina, Shelly and I really got serious in our exploration of these devices. This is really credited to Honey because she thought there were a few devices that really worked and had good science. We, especially Honey since she is such a research nerd, narrowed our focus to 3 devices—coolsculpting, sculpsure, and ultrashape/ultrashape power. We read a lot, talked with peers across the country, experimented with the various devices and finally chose Ultrashape. Our diligence in research has paid off because after a few months, the results that we and our patients are achieving have surpassed our expectations. In addition to adding the Ultrashape to our practice, we have also offer Kybella, Velashape and subcision to enhance our figures. Here is the “skinny” on these 3 treatments. 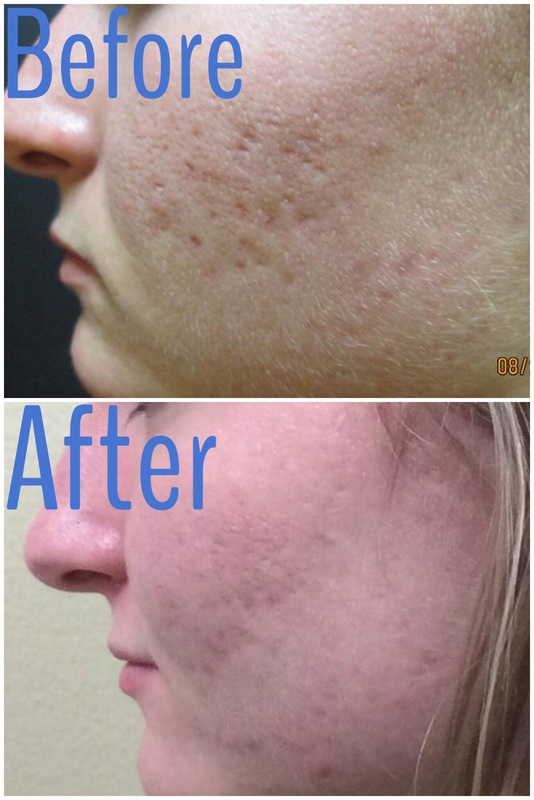 Kybella—Kybella is an FDA approved treatment to permanently dissolve the fat under the chin. It is used to treat “submental fullness”. Since we were one of the first 10 clinics in Arkansas approved by Allergan to inject kybella, we have a lot of experience and are loving the results allowing patients to put their best chin forward. FYI, even Nina and her husband Jarrard have been treated with kybella. If you are interested, we have many videos where Nina and I inject kybella on the Johnson Dermatology Facebook page. 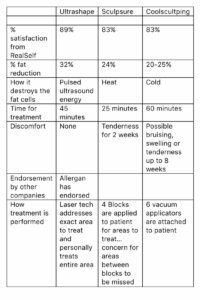 Velashape—Velashape is a wonderful adjunct to Ultrashape Power offering our patients (and us) a way to reduce circumference (the size of my thighs) and cellulite. 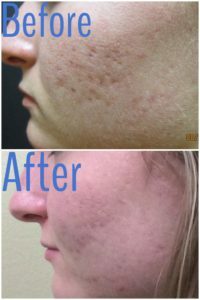 Real Johnson Dermatology patient results! Subcision—Subcision is a minor surgical procedure we offer in clinic independently or in combination with sublative or velashape treatments. As opposed to the newer treatments and technologies we offer, we have been offering subcision since I graduated medical school 20 years ago. It is a tried and true treatment. Johnson Dermatology patient after one subcision and sublative session. 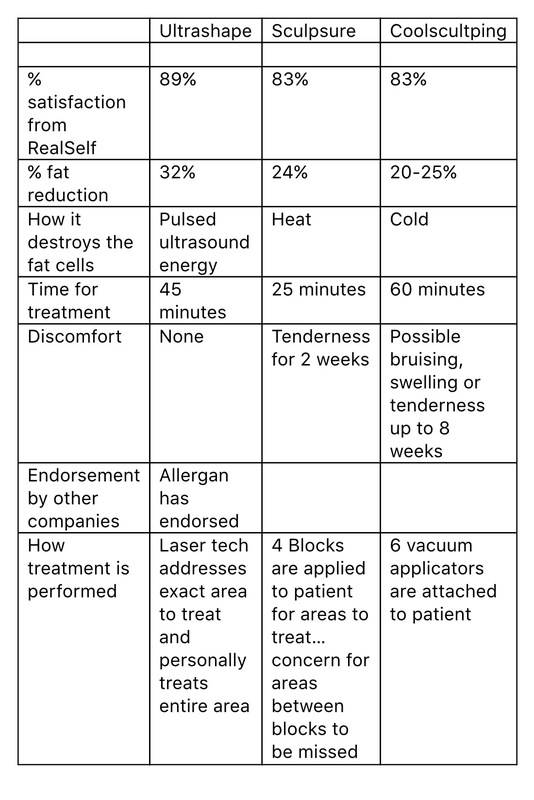 In case you were wondering how we compared the fat busting devices, here is a chart that we used. 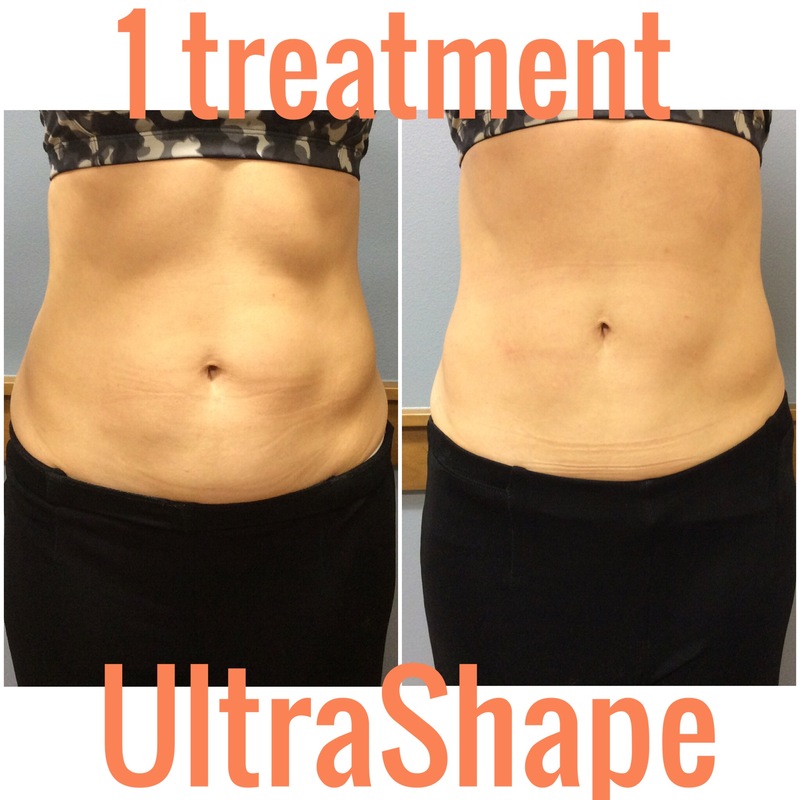 I would like to give one more shout out to Honey and Shelly for putting in so much time and energy for allowing us to make the no brainer decision to add Ultrashape Power to our clinic. My jeans and I thank you. Dr. Sandy after only one Ultrashape treatment. Nina before and 3 months after the one recommended Sculpsure treatment. Thank you Dr. Sandy for sharing your knowledge with all my blog readers. I know everyone enjoys learning from you as much as I do. Please join us live on Johnson Dermatology Facebook tomorrow evening to watch a live Ultrashape procedure and participate in Q&A. If you have any questions or would like a consult for any of the body contouring techniques please e-mail dani@johnsondermatology.com or call the clinic at 479-649-3376. Have a great week everyone!